China: Manufacturing Slides Most In Ten Months! As the global recession deepens, bad news in Asia continues to mount. China and Japan are leading the Asia-Pacific decline. 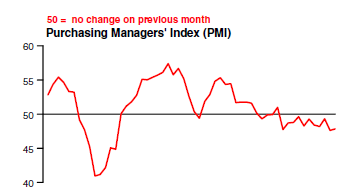 The HSBC Flash China Manufacturing PMI™ is negative once again with Output down at Sharpest rate in Ten Months. 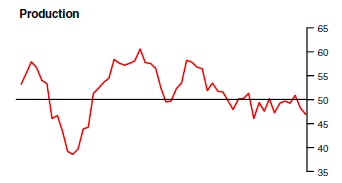 Flash China Manufacturing PMI™ at 47.8 (47.6 in August). 2-month high. Flash China Manufacturing Output Index at 47.0 (48.2 in August). 10-month low. The Financial Times reports Japan suffers steep fall in exports. Japan recorded another steep fall in exports in August, highlighting the vulnerability of the nation’s finances amid persistently high imports of fuel. Thursday’s government data showed that shipments slipped almost 6 per cent from a year earlier to Y5tn ($64bn), the third monthly fall in a row, while imports were 5.4 per cent lower at Y5.8tn. The resulting trade deficit of Y754bn was among the widest since last March, when the Fukushima crisis led to the staggered closure of the country’s nuclear reactors. Adjusted for seasonal variations, Japan has recorded trade deficits in each of the 18 months since the earthquake and tsunami, after decades of more or less uninterrupted surpluses. Now, as the government edges towards a gradual phasing-out of nuclear power, increasing its reliance on imported fossil fuels, many expect these deficits to linger. Provisional data from the ministry of finance showed that in August shipments to western Europe fell by 28 per cent from a year earlier, thanks to big falls in exports to Germany (18 per cent) and the UK (42 per cent). Exports to China, meanwhile, posted their third successive decline. August’s 10 per cent fall was only slightly better than a 12 per cent slump in July. Japan has been in a trade deficit position, seasonally adjusted, for 18 months. Territorial disputes with China are likely to cause further economic damage. Should China withhold rare earth elements from Japan, the result could be crippling. Rare earths are used in cell phones, computers, bombs, DVD, batteries, catalytic converters, and numerous other devices. For now, Japan still has a current account surplus in spite of an ongoing trade deficit, but that situation will not last forever. When it ends, Japan will need external financing of its mountain of debt, or it will end up turning to the printing presses. I remain bearish on the Yen, but I am not able to put a specific time frame on when Japan’s serious issues start to matter.